My only regret with this Orange & Coconut Cake is that I wished I’d made it sooner and then I could have personally thanked my Nanny. 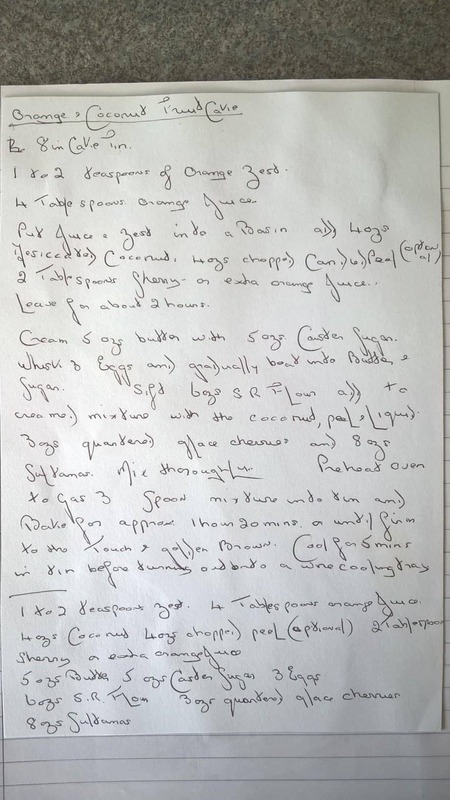 The recipe below is in my Nanny’s handwriting and I literally changed the flour to Doves Farm Gluten Free flour and because I had it in the cupboard I used Cointreau® instead of Sherry. I can honestly say this is the best orange cake I’ve ever tasted…you know that cake you had, the one that keeps popping into your mind from time-to-time, you can almost taste it and your mouth prickles as you salivate?…this is THAT cake!